Follow my journey to naturally lose 50 lbs. in 6 months (200 Days) beginning 11-11-11. 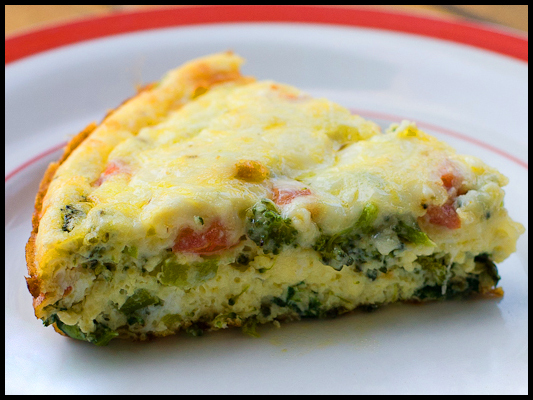 A Frittata is an Italian version of an omelet. Often compared to a crust-less quiche or, in America, "scrambled eggs." The Vegetable Frittata is not only a healthy alternative to a high-carbohydrate and calorie filled breakfast, the Vegetable Frittata is also easy to make and can be reheated as leftovers for a nutritious breakfast every day of the week. Happily married and living in sunny (most of the time) Los Gatos, CA. I love gardening, cooking and movies! My professional background is in high-tech and I recently received Technical Writing Certification and am currently pursuing Project Management Certification.